Home » Sala apartment and villa » Where is The Sun Avenue apartment in District 2? Where is The Sun Avenue apartment in District 2? The more closed to the day foreigners can buy property in Vietnam, the more demand of informaiton about some big projects of apartment in District 2. With a Thu Thiem canal under Saigon River, resident in District 2 now can easily go to The Saigon Business Center within 5 minutes. Therefore some projects like The Sun Avenue of Novaland, The Krista apartment or Sala premium residence are now very hot and attract a large notice of many foreigner. One of that century projects of Ho Chi Minh City is The Sun Avenue aparment with 8 buildings along the Mai Chi Tho hightway. So we would like to answer and inform for all of foreign customer and investor know the very majestic location of The Sun Avenue apartment in District 2. You will be persuaded by its attraction of conveniences, just 1 minute by auto from Sala Premium Residence! The Sun Avenue Apartment also possesses outstanding design of ventilation, ensuring unrestricted visibility and various internal facility, ensuring strong added value over time. A number of notably key transport projects in District 2 can be referred to as: Xa Lo Ha Noi Highway, road extension of Dien Bien Phu Street which starts at Saigon Bridge connects District 2 to the east District like District 9, Thu Duc district, and other eastern provinces. With this route, people will easily take a quick moving from District 2 to the adjoining districts like District 9, Thu Duc District, Binh Thanh District. Being designed with modern harmony with nature gives The Sun Avenue Apartment always get natural light, pure and fresh air … give you a overlooking beautiful view, airy space with modern luxury design. 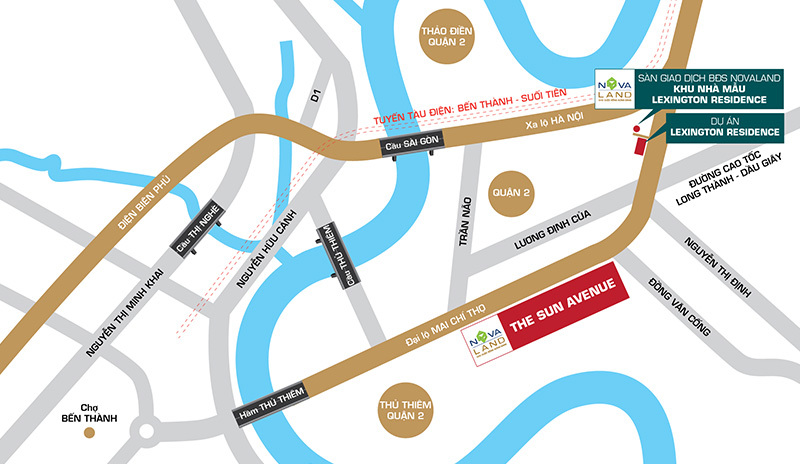 Second route is Mai Chi Tho Avenue (route connecting the east and west of Saigon) make traffic becomes extremely convenient when moving from District 2 to District 1 in center via Thu Thiem Tunnel. With convenient transportation, inspired by some model apartment in Europe, Novaland firmly develops The Sun Avenue Apartment to be a luxury complex apartment in Ho Chi Minh.